Here we go again with the pretzels, but instead of filling the loops with peanut butter, I’ve filled them with a special melted caramel mixture that stays soft under the firm chocolate. I’ve been “handcrafting” these for family and friends and have kept the batch sizes small, which in this case means three pretzels. Once you get the hang of making the pretzels you’ll probably want to scale the recipe up and make more than three at a time. But for now, here are the ratios you need to make three delicious homemade caramel filled chocolate covered pretzels. First, line a tray or a plate with parchment paper or foil and have ready three full size pretzels. Melt the chocolate using your favorite method. I have a chocolate melting pot, but for small batch recipes I just use a ramekin and the microwave. For the 3 pretzel batch, I used 1/2 cup (3 oz) of chocolate chips and a teaspoon of coconut oil to make the melted chocolate chips more suitable for dipping. 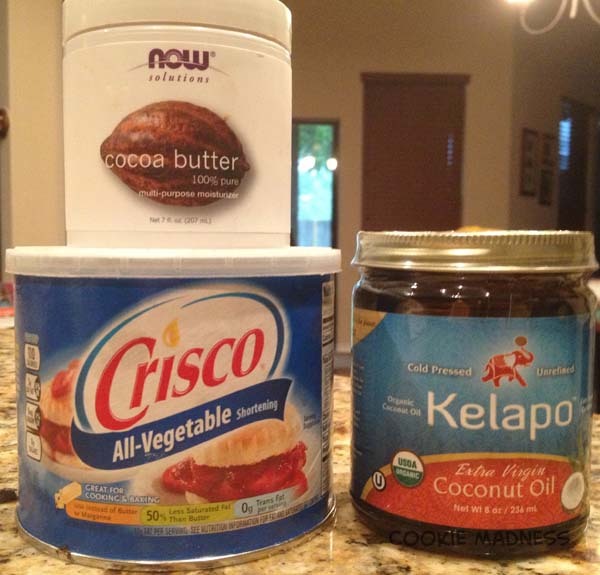 The drawback with that is coconut oil will make your chocolate slightly coconut flavored. If you want to keep the flavor of the chocolate prominent, try using food grade melted cocoa butter or shortening. 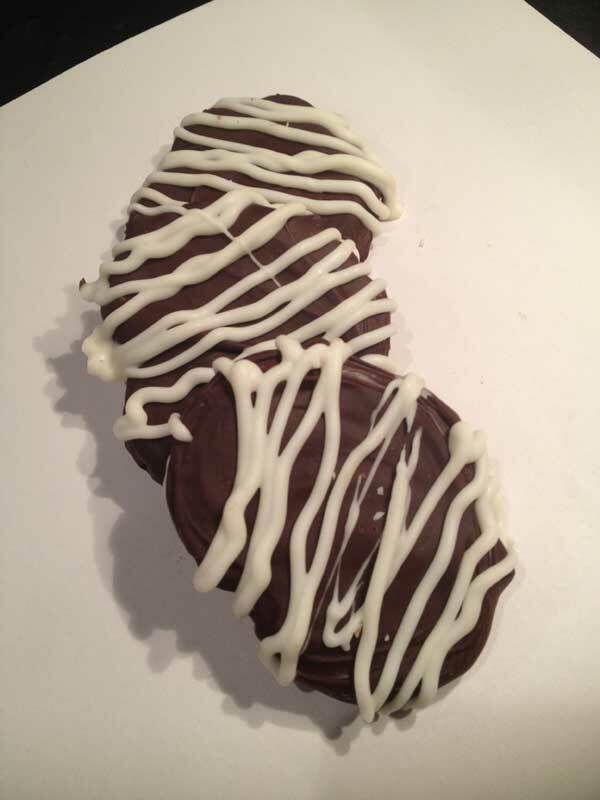 And if you don’t want to add anything to your chocolate, use dipping wafers, almond bark or couverture. Sigh, my special Callebaut is all gone :(. Melt the chocolate at 50% power, stirring every 30 seconds. Dip the pretzels in chocolate and lay them on the parchment lined tray. Spoon a very small amount of chocolate inside each loop to make a “floor” for the caramel or skip the first dip and just make the pretzel floor. I like a higher ratio of chocolate to caramel, so I’ve been putting chocolate all over the pretzel before making the floor and filling the loops. Time to make the caramel! You’ll probably want to scale this up at some point and you may even want to do it in a saucepan. However, I’ve found that the microwave works really well for small batches. 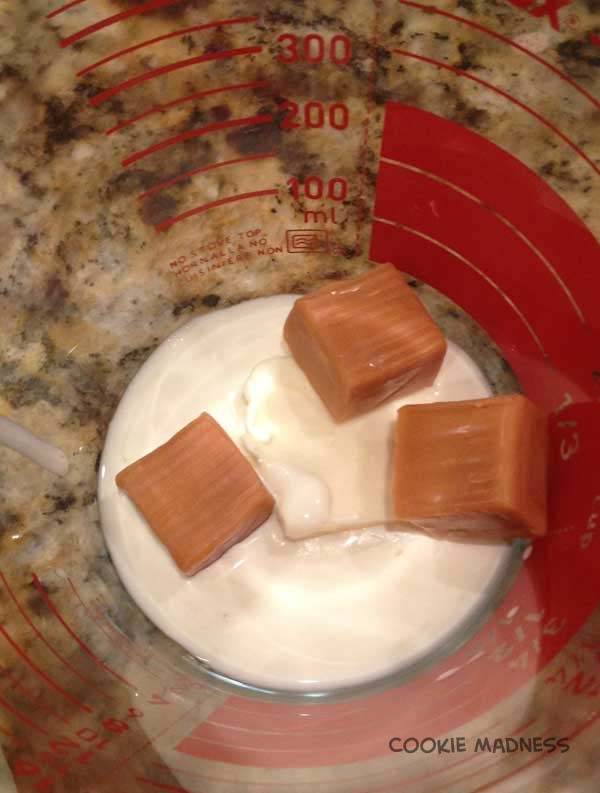 Put 1 teaspoon of butter, 1 teaspoon of heavy cream and 4 unwrapped caramels in a 2 cup microwave-safe measuring cup. If you don’t have a glass measuring cup you can use a microwave-safe bowl, but make sure the sides are high so the mixture won’t boil over or splatter when you stir it. 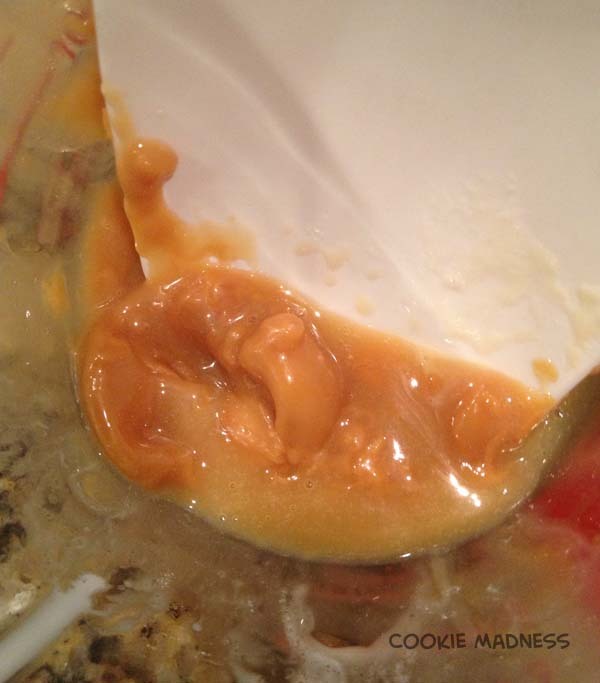 Update: If you are using unwrapped caramel bits, use about 3 tablespoons or weigh about a little less than an ounce. Microwave on high for 15 seconds or until the caramel mixture is soft and lumpy — it won’t be completely smooth at this point, but the caramels should be soft enough so that you can stir them into submission. This is how mine looked after 15 seconds, but I kept stirring madly until the mixture was very smooth. 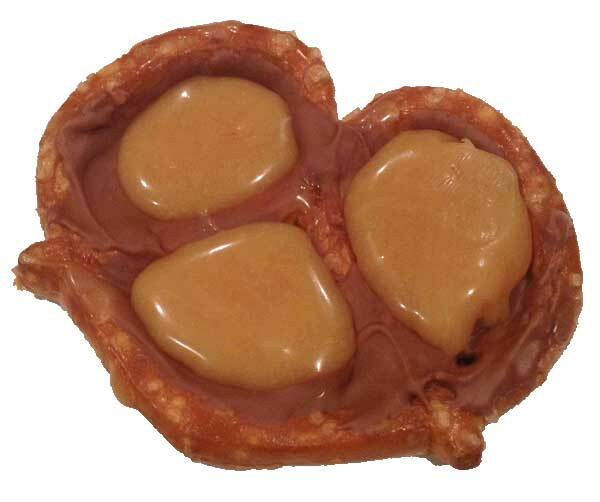 Fill the pretzel loops with melted caramel. 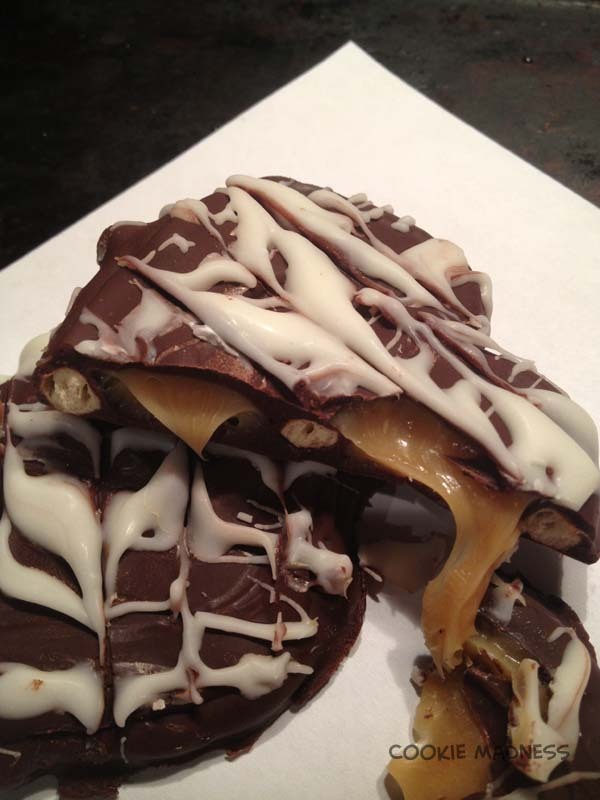 Let the caramel cool for about 5 minutes in the refrigerator, then spoon melted chocolate over the pretzels. 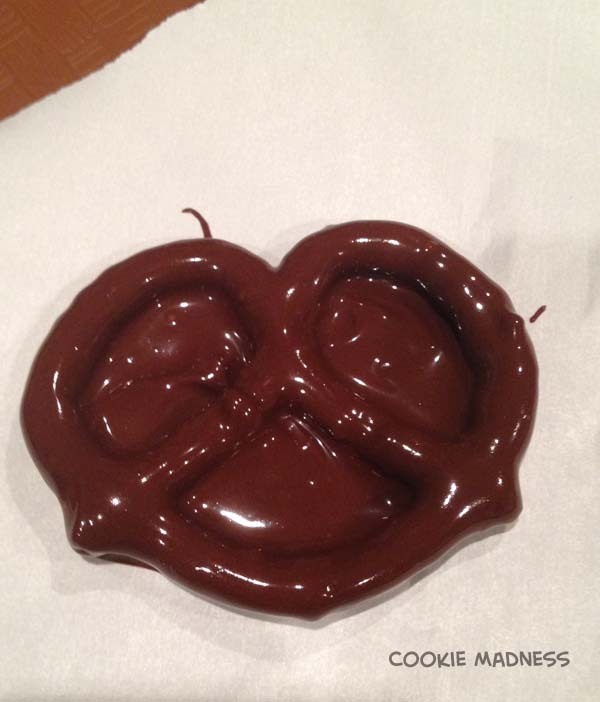 Let the chocolate covered pretzels set once more, then melt a little white chocolate and drizzle it over the top ornately. You can also jazz them up a bit by putting seasonal sprinkles on top. Actually, there are lots of things you could put on top, but I kept this batch kind of plain. I’ve never tried it with half & half. If it works, let me know! Judy, if I were making them as a gift I’d make them a day or two ahead of time (depending on my schedule) and freeze them until ready to package and serve. I’m not sure how long they stay fresh at room temperature, but I’m guessing you could freeze them for a few weeks if need be. How long do you think these would stay fresh? I would like to take a bag of them for a hostess gift when I go to Dallas for Christmas. Thank you. Anna gotta say the thing about these recipes I love is they’re pretty easy to make. This is probably the idea football snack. Anna, I don’t recall the specific name of the product but Kraft also makes “beads” of caramel that are easy to melt for caramel apples and such — the “beads” are about the size of a pea. They’re sold in bags near the chocolate chips and such and I usually see them year-round at WalMart and at some Target stores. Yours sounds like an easy enough process to melt the caramels but these would make it even easier. Might give these pretzels a try for the holidays! Darlene, I’m definitely going to try that. It seems like all we’d need to do is rub some peanut butter on the caramels, sprinkle chopped peanuts on that, then dip in milk chocolate rather than dark. It might even be better made with mini pretzels — perhaps the thin, square ones, and then you could use two pretzels and make a sandwich before dipping. Rebecca, that is a good point. I tend to buy the brands with more flavor, but I’ll pick up a less flavorful brand for chocolate dipping. I’m glad to hear coconut oil was recommended in a candy book because usually those books just recommend shortening. I’m drooling! 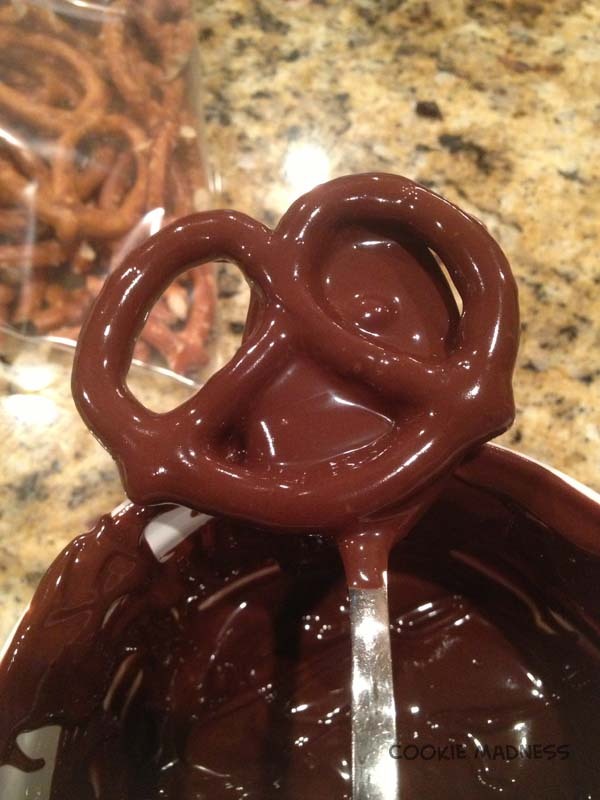 I need to try this – I can already think of lots of yummy things to try filling the pretzels with. I ‘ve been using “expeller pressed” coconut oil and it doesn’t seem to have any detectable coconut flavor when mixed with other things. One of my candy making books recommended this type as it’s apprently more refined and almost flavorless. Holiday Baker Man, I think these deserve a Double WOW!! These look absolutely fantastic. If I could just find a way to incorporate peanut butter into the mix, I’d have all the makings of a Take 5 bar (my favorite). Anna, if you could get right on that, I’d really appreciate it (just kidding, I think).